Travel with Kevin and Ruth! : Off to the beach! Yesterday was a rest day so everybody did their own thing. A couple went into the Walmart, and another couple had missed the big tree the other day in el Tule, so they went in to see it on their own. I think everybody else just hung around the campground. We chose to get out and get some exercise because we had seen a path going up a hill in behind the campground. Bob and Denise like to hike too, so they came with us along with dog Scarlet. It's so nice this year having another couple in the group that like to hike. I mean, we would be doing it anyhow, but this year we get some company. Ruth, Scarlet (the dog), Denise, and Bob. We had left at 9:00am, and we were gone for two and a half hours. We did 9 kms (5.6 miles). In the afternoon, just puttered around. Checked the oil and the tires and put things away to get ready for our drive today. 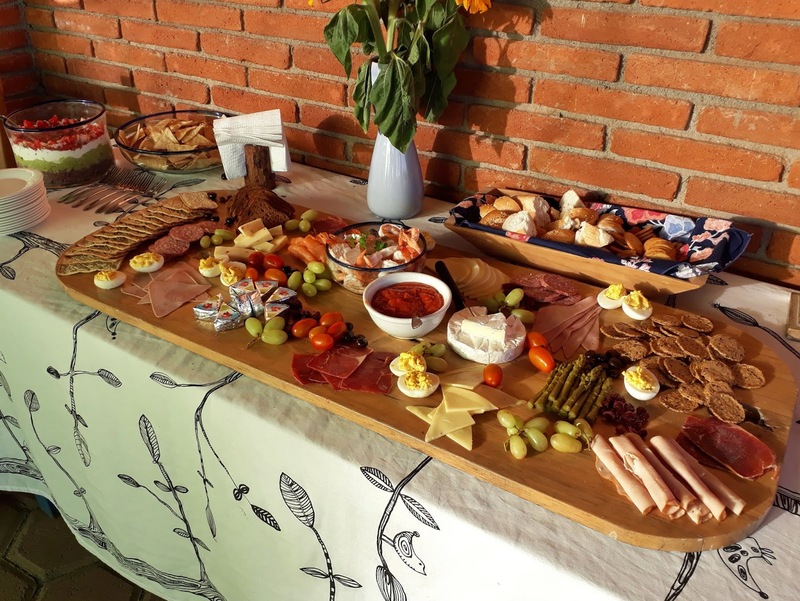 Quite a spread they put on for our group! They've been great hosts and we enjoyed our visit here. But, we are off to the beach! We have been in Mexico for seven weeks now, and this will be our first sighting of the ocean! We're headed to Hualtulco... one of our favorite rustic campgrounds on a beautiful beach used by a couple of all inclusive resorts. There's usually lots of bird life around, and we are looking forward to our stay there! A bit of a long driving day, so we're up early and ready for an 8:00am start. Eternabond RV Roof Seal is at a good price. Should be in every RV'ers tool box! Are you skipping Puerto Escondido then? You wouldn't need much supper after a spread like that! I think perhaps you are more excited than us! If we had our way we would most likely stay inland and enjoy the perfect weather and no bugs, opposed to the baking hot weather and biting bugs. ;-) However we are looking forward to the beach at least for a short time. Awesome views on your hike - you can see forever!! Nice that you have hiking partners, too. Great way to get your walking in. Love the Happy Hour spread!! Carry on to the beach!!!!!!!!!!!! Great view of Oaxaca City and the mountains!